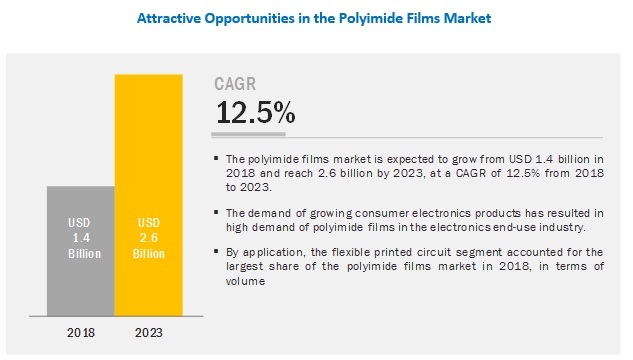 [197 Pages Report] The polyimide films market is estimated to be USD 1.4 billion in 2018 and is projected to reach USD 2.6 billion by 2023, at a CAGR of 12.5% from 2018 to 2023. Surging demand for polyimide films in developing nations and preference for transparent polyimide films are some of the key opportunities for the polyimide films industry. The use of polyimide films in flexible printed circuits helps in providing additional thickness, which is required by the end-use industries such as electronics and automotive. Based on application, the flexible printed circuits segment is projected to grow at the highest CAGR mainly due to the growing demand in mobile devices, computers, and automobile & military electronics. Electronics, automotive, aerospace, and labeling are some of the key end-use industry segments of the polyimide films market. Electronics is estimated to be the largest end-use industry segment of the market in 2018. It is also the fastest-growing segment and is projected to dominate the market in the near future. Automotive is estimated to be the second-largest segment, whereas the aerospace segment is projected to grow at the second-highest CAGR during the forecast period. The Asia Pacific region is estimated to be the largest market for polyimide films in 2018. China, India, Japan, and South Korea are the major countries in this regional polyimide films market. Innovation, price deflation, and rising household incomes, especially in emerging Asian markets, have resulted in the high demand for consumer electronics products, thereby contributing to the growth of the polyimide films market in the region. Some of the key players in the market include E. I. du Pont de Nemours and Company (US), SKC Kolon PI Inc. (South Korea), Toray Industries Inc. (Japan), Kaneka Corporation (Japan), Ube Industries (Japan), Taimide Tech. Inc. (Taiwan), Arakawa Chemicals Industries Inc. (Japan), Shinmax Technology Ltd. (Taiwan), and FLEXcon Company, Inc. (US). These market players have adopted strategies such as new product launch and plant expansion in order to meet the growing demand for polyimide films and to increase their market share. In April 2018, Taimide Tech. began the Phase 2 construction of its Tongluo Branch. The purpose of this development is to increase the production capacity of the branch in order to meet the increasing demand for polyimide films. In July 2018, Kolon Industries began the mass production of its innovative Colorless Polyimide film, Kolon CPI. The company had invested USD 80 million to build the production line for Kolon CPI. This development has opened the market of foldable smartphone cover windows for the company. How will these developments affect the industry in the mid to long term? What are the upcoming industry applications for polyimide films? What is the impact of changes in government policies on the polyimide films market? What is the total size of the polyimide films market? What are the different applications of polyimide films? 10.8 Mitsubishi Gas Chemical Company Inc.
10.1 SKC Kolon Pi, Inc.
10.11 Arakawa Chemical Industries, Ltd.
10.15 Taiflex Scientific Co. Ltd.
10.16 Evertech Envisafe Ecology Co., Ltd.
10.18 Yongkang Haotai Industry and Trade Co., Ltd.
*Details on Business Overview, Product Offerings Scorecard, Products Offered, Business Strategy Scorecard, Recent Developments Might Not Be Captured in Case of Unlisted Companies. 10.20.1 Parafix Tapes & Conversions Ltd.
10.20.4 Yunda Electronic Materials Co., Ltd.
10.20.6 Suzhou Kying Industrial Materials Co., Ltd. The study involved 4 major activities in estimating the current polyimide films market size. Exhaustive secondary research was undertaken to collect information on the market, peer market, and parent market. The next step was to validate these findings, assumptions, and sizing with industry experts across the value chain through primary research. Both, top-down and bottom-up approaches were employed to estimate the complete market size. Thereafter, market breakdown and data triangulation procedures were used to estimate the market sizes of segments and subsegments. As a part of the secondary research process, various secondary sources, such as Hoovers, Bloomberg, BusinessWeek, and Dun & Bradstreet were referred to identify and collect information for this study. Secondary sources included annual reports, press releases & investor presentations of companies, white papers, certified publications, and articles from recognized authors, authenticated directories, and databases. Secondary research was mainly conducted to obtain key information about the industry’s supply chain, market’s monetary chain, the total pool of players, and market classification and segmentation according to industry trends to the bottom-most level, regional markets, and key developments from both, market- and technology-oriented perspectives. As a part of the primary research process, various primary sources from both the supply and demand sides were interviewed to obtain qualitative and quantitative information for this report. Primary sources from the supply side included industry experts, such as CEOs, vice presidents, marketing directors, technology and innovation directors, and related key executives from various key companies and organizations operating in the polyimide films market. Primary sources from the demand side included directors, marketing heads, and purchase managers from end-use industries. The industry’s supply chain and market size, in terms of value, were determined through the primary and secondary research processes. After arriving at the overall size from the market size estimation process explained above, the total market was split into several segments and subsegments. To complete the overall market engineering process, and arrive at the exact statistics for all segments and subsegments, data triangulation and market breakdown procedures were used, wherever applicable. The data were triangulated by studying various factors and trends from both the demand and supply sides. In addition to this, the market was validated using both, top-down and bottom-up approaches. Toray Industries Inc.(Japan), SKC Kolon PI Inc. (South Korea), Kaneka Corporation (Japan), Ube Industries (Japan), Taimide Tech. Inc. (Taiwan), Arakawa Chemicals Industries Inc. (Japan), Shinmax Technology Ltd. (Taiwan), FLEXcon Company, Inc. (US). This research report categorizes the polyimide films market, based on application, end-use industry, and region, forecasting revenues as well as analyzing trends in each of these submarkets.